If you’re itchin to rock a ‘stache of your own, check out some of the mustache themed items I’ve found online! I looove this mirror. How cute are these socks? Even your dog can get in on the mustache rage with this toy. Cafe press has a gajillion mustache themed items. And there’s even an App for that! 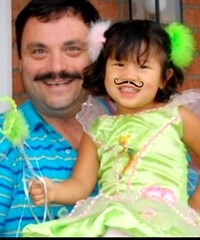 I used the app Mustache Me to give Emily a mustache to match her daddy’s. So cute!! LOL! I’ve actually noticed this trend myself! Its pretty funny! It always makes me think of the 70’s!